As our subscribers will have heard, refinements of the new Index database application are proceeding on schedule, and on March 30 it will become the primary and only route to online search of Index records. We think you’ll find the new platform much more user friendly and appreciate features such as filtered searching, a date slider, and (mirabile dictu) immediately visible thumbnail images. Subscribing institutions should be switching the URL to https://theindex.princeton.edu, and some may have done so already. You should also be able to access the database by navigating to this URL if you are on site and using the IP range of a subscribing institution. If you’d like a jump start in using the new system, please check out the tips below. Your feedback is welcome at theindex@princeton.edu. Once there, click on the “Search” dropdown and choose “Advanced Search.” Type one or more keywords into the “Search Expression” line for a Boolean search, which can be filtered by Work of Art Type, Creator, Location, etc. in the fields below; dates can be refined using the slider. Exact-phrase searching iis coming in the next few weeks, so if it isn’t active when you visit, please check back. Clicking the search button calls up a results list that appears below the search filters; click thumbnails to see the full records. Works can also be searched for by browsing the Index authorities for Subject, Creator, Patron, among others; each authority includes an expandable bar containing to the records in which the term appears. As you try out the site, please remember that some design elements and search tools are still actively in development: layout, terminology, and search dynamics still may change. This makes your feedback all the more useful, as it helps us to evaluate future refinements. We look forward to hearing from you! Throughout the Middle Ages, the feast of the Presentation of Christ was observed on February 2nd, where it gradually absorbed the rites of the Purification of the Virgin. 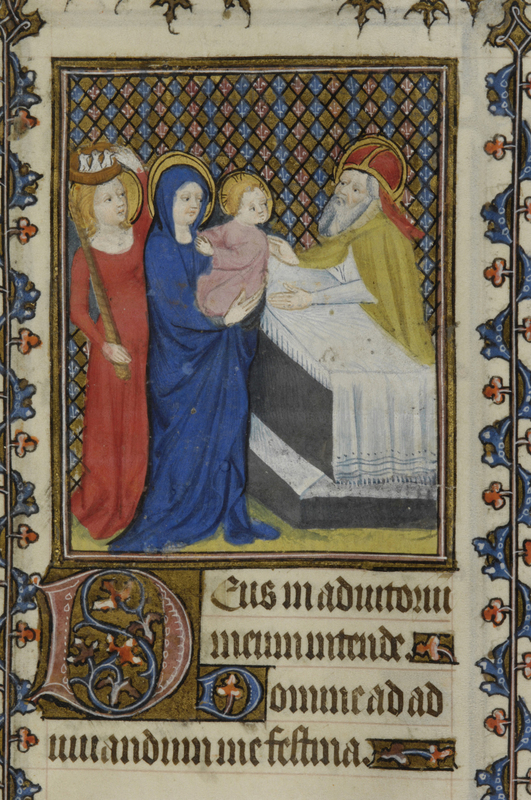 Incorporating blessed candles and certain songs, the feast came to be known as Candlemas. The only gospel writer to describe the Presentation of Christ in the Temple was Luke in the second chapter of his Gospel account (Luke 2:22–39). Luke writes that, in accordance with Jewish tradition, parents were required to bring an acceptable offering in exchange for the priest’s redemptive blessing on their child. Luke notes that “a pair of turtledoves, or two young pigeons” would fulfill the sacrifice (Luke 2:24). In Presentation scenes, the gathered doves, usually held by Joseph, signal Christ’s restoration under Mosaic Law. Over time, lit candles at this same ritual came to mark the Virgin’s cleansing and reentry into the temple. In a stained-glass window in Canterbury Cathedral, we find Joseph holding both implements at the far left, a visual sign of the combined purpose of their visit (Figure 1). When the Holy Family approaches the altar, Luke records two mystical occurrences that concern key witnesses in the temple. First, Simeon, the named priest from Jerusalem, prophesies the divinity of the Christ Child. Another prophetic utterance comes from the lips of an unlikely source, the temple’s aged widow, Anna the prophetess. Luke tells us that Anna fasted and prayed there without ceasing. Anna is the New Testament’s only prophetess, and her privileged glimpse of the important ritual uniquely connects her to the childhood of Christ. Figure 2. 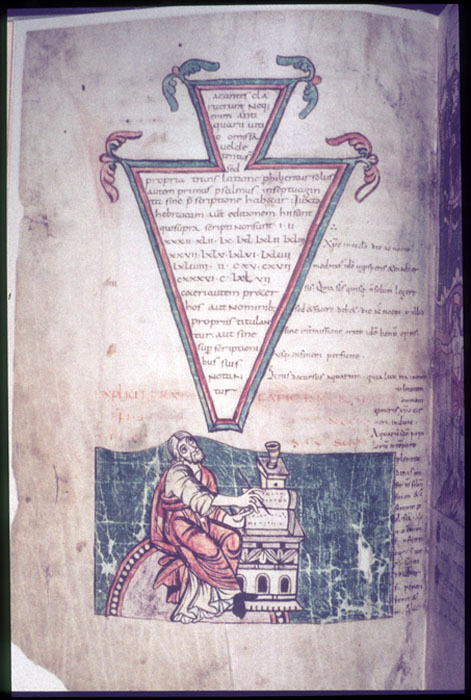 Presentation scene in the Mont-Saint-Michel Sacramentary (Normandy, 1050-1065). New York, Morgan Library, M.641, fol. 18r. Analysis of Presentation scenes does reveal a few key details consistently associated with Anna: the presence of a halo; her scroll, which expounds her part in the prophecy; her interaction with presentation/purification implements, including the doves and candles; and her advanced age, sometimes suggested by her modest wimple. One or more of these details could be enough for a positive ID of our prophetess. Another sign is her speaking gesture, as in the Presentation miniature in the Romanesque Mont-Saint-Michel Sacramentary, in which Anna’s hands are shown outstretched in a wide statement of praise (Figure 2). This miniature also exemplifies an iconographic conundrum that sometimes accompanies Anna: a second nimbed and veiled female figure stands just behind Joseph, and she is carrying two doves in draped hands. Is this a second Anna? Or is this simply a sanctified female attendant? This female assistant is doing what many later Annas do in bearing the sacrificial birds, so the context with which we identify Anna becomes increasingly important. Figure 3. Anna holding inscribed scroll at the Presentation of Christ, wood panel by the 15c. Byzantine Painter. New York, Metropolitan Museum of Art, 31.67.8. Anna is one of the first people, even the first woman, to reveal Christ’s destiny, but her exact words are omitted from Luke’s account. We know that she “spoke of him to all that looked for the redemption of Israel” (Luke 2:38). However, since Anna’s actual words are not recorded, her scrolls present a number of different inscriptions. An Index search reveals some of the most intriguing ones. In the fifth-century sanctuary apse mosaic at Santa Maria Maggiore in Rome, Anna’s scroll is inscribed BEATVS VENTER QVI TE PORTAVIT (Luke 11:27), meaning “Blessed is the womb that bore thee.” In a late twelfth-century mosaic in the Cathedral of Monreale, Anna holds a scroll inscribed POSIT(US) EST HIC I(N) RVINA(M) (Luke 2:34), repeating the words first said by Simeon, “This child is set for the fall.” In a fifteenth-century panel by the artist known as the “Byzantine Painter,” Anna holds a scroll inscribed (in Greek) “This child created Heaven and Earth” (Figure 3). And in one emotive declaration in a ca. 1240 Psalter from Hildesheim, Anna’s scroll is inscribed in Latin, EXULTATUIT COR MEUM (I Samuel, 02:01, also known as the Canticle of Anna), meaning “My heart hath rejoiced” (Stuttgart, Landesbibliothek, Cod. Don. 309, fol. 37r). Figure 4. 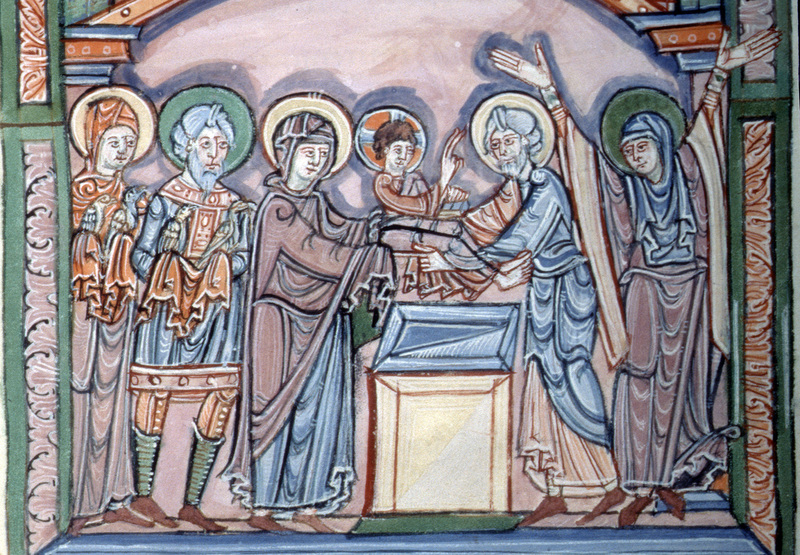 Prophetess Anna holding pseudo-inscribed scroll at the Presentation of Christ in the T’oros Roslin Gospels. Dated 1262. Baltimore, Walters Art Museum, W.539, fol. 211r. Anna’s scroll has even been used to identify her by name, as in the presentation scene on the ca. 1365 Florentine Ashmolean Predella, from a private collection in Tuscany, with a scroll inscribed “ANNA PROFETESSA DEO GRATIAS AMEN” (“Prophetess Anna, Thanks be to God”). In this case, Anna’s index finger is elegantly lifted upward to indicate from whom her proselytizing originates. In other examples, Anna’s scroll can be completely blank, or filled with a pseudo-inscription. In the Armenian T’oros Roslin Gospels, the scroll expands into neat folds revealing simple red rulings (Figure 4). The new advanced filter options offered by the Index database can reveal interesting trends within the Anna images recorded by the Index. I performed a keyword search for “Anna,” filtering by the subject Christ: Presentation, and restricted the search to fifteenth century examples (setting the date slider at 1400 to 1499). I limited these examples further with the Work of Art Type filter set to “Manuscript.” This way, I found over 60 records of interest describing fifteenth century illuminations that include this scene. I narrowed these results further by adding a second subject filter with one of the Index’s grouped terms, Candle: held by Prophetess Anna. I found that, with each refinement, I was able to reconstruct Anna’s changing representation in medieval iconography. Curiously, in several of these late medieval examples, Anna is holding both a candle and a dove, and she is directly behind the Virgin Mary (not Simeon), displacing Joseph completely. These three-character scenes of the Presentation make up a good portion of later examples, and they underscore Anna’s union with the Holy Family’s first official appearance. In one such image, a fifteenth-century Book of Hours made in Paris, Anna is holding a candle in her right hand while playfully balancing a basket of birds on her head. A talented multitasker, Anna has, in a sense, usurped Joseph’s gift-bearing role (Figure 5). Figure 5. Prophetess Anna balancing basket of three doves on her head and holding candle at the Presentation of Christ. Book of Hours (ca. 1400). New York, Morgan Library S.9, fol. 79r. No matter how she appears—as a wise widow bearing her scroll, or as a female witness bearing the implements of the impending ritual—the prophetess Anna is an exemplary New Testament woman. Through her time-honored vows of chastity, piety, and obedience to God, virtuous qualities brought out in her varied iconography, she presents a model of behavior for the young mother. Shorr, Dorothy C. “The Iconographic Development of the Presentation in the Temple.” The Art Bulletin 28, no. 1 (1946): 17–32. Schiller, Gertrud. Iconography of Christian Art, vol. 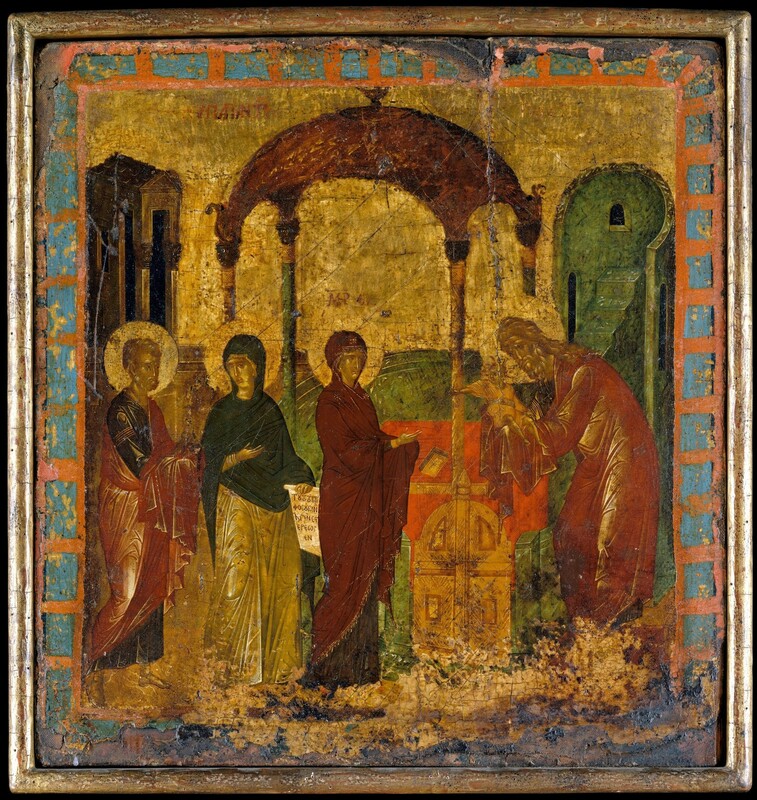 2, The Presentation of Christ in the Temple, trans. Janet Seligman (Greenwich, Conn.: New York Graphic Society, 1972): 90–94. Elliott, J. K. “Anna’s Age (Luke 2:36–37).” Novum Testamentum, 30, Fasc. 2 (Apr., 1988), 100–102. Hammond, Joseph. “Tintoretto and the ‘Presentation of Christ’: The Altar of the Purification in Santa Maria Dei Carmini, Venice.” Artibus Et Historiae 34, no. 68 (2013): 203–217. 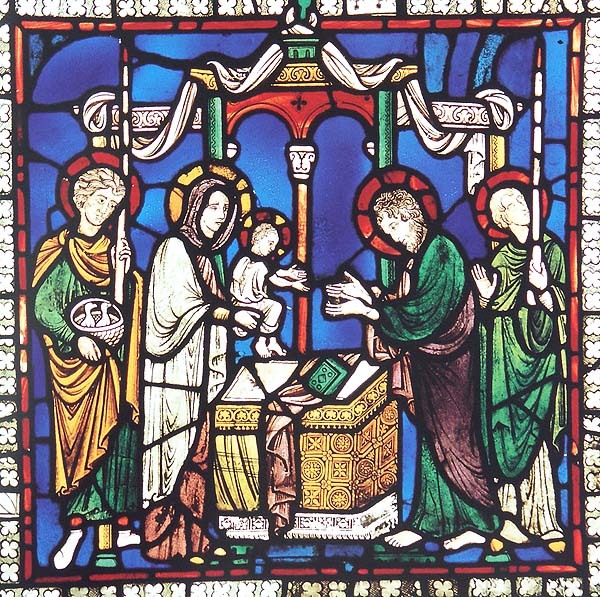 “Presentation of the Christ Child in the Temple.” In The Oxford Dictionary of Christian Art & Architecture, edited by Murray, Peter, Linda Murray, and Tom Devonshire Jones: Oxford University Press, 2013. From at least the fourth century this ritual was celebrated as a post-purification feast, known as Hypapante, which Justinian set 40 days after the feast of the Epiphany, or on February 14. For the best study of the development of this iconography, see Dorothy C. Shorr, “The Iconographic Development of the Presentation in the Temple,” Art Bulletin 28 (1946): 20–46. 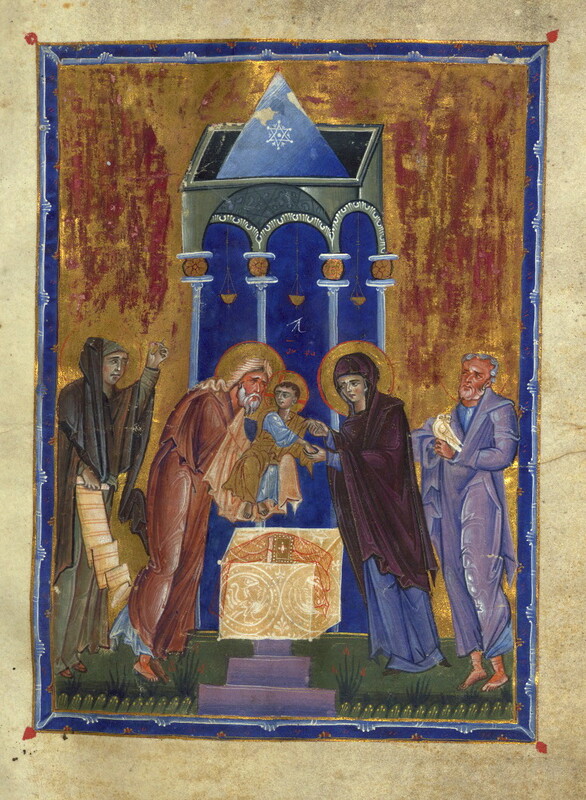 Simeon holds the infant in his arms and instantly says to the Virgin Mary, “Behold this child is set for the fall, and for the resurrection of many in Israel…,” and representations of Simeon are associated with the text Nunc Dimittis, also known as the Canticle of Simeon (Luke 2:34–35). Shorr notes that, in most northern medieval examples after the thirteenth-century, Anna’s place was taken over by a young handmaiden (Shorr, 1946, p. 27).